It was a cool spring day, and I was extremely happy. The sun was shining bright, but I couldn’t tell you if there were any birds chirping because I was too focused on what I was about to do. It had to be done and there was no stopping me. I was tired of the same routine month after month, and my destination was now in sight. I took a second to canvas the area before making my move. There were two guys at the door and they were loaded to the max with heavy artillery. I had to think fast. Every second that went by felt like two—time was running out. I knew what I had to do. I walked swiftly in their direction hoping I could squeeze by without detection. You see, they did not know who I was—the enemy. A guy that had encouraged many others to do what he was about to do—a loner. There aren’t many like me and I had been dreaming of this day for a very long time. I was practically drooling. It’s a good thing I had enough cash in my pocket to pay for that kleenex. I made it to the door but getting past these guys was going to be hard. The one on the right reached his hand up from his jacket pocket, and I thought it was all over. “Would you like a free hat, sir?” he said. What do I say? Until recently, I had always said yes. I had to be strong, but this was different. The hat had a triple-platinum star embroidered on the front, with the word “important” written on the back. I tried to ignore him but he was too persistent. Before I knew it the other guy was moving in fast. They both must of sensed what was coming, because they started to reach in their back pockets. I needed to just say it, but before I could, that’s when it happened. Pointed right at my face, they brandished not one, but two free shirts. I stayed calm. By calm I mean I stuck my fingers in my ears, closed my eyes, and ran as fast as I could while repeating the one word they hate the most. “NO!” (no no no no NO NO no no) As I repeated that now harmonious word over and over, it sounded like a musical in my head. I wanted to break into a quick dance but I remembered I hated musicals. Back to the task at hand. I wasn’t sure if my plan worked because I was too scared to look back. I unplugged my ears and it seemed safe—they were gone. I could hear in the distance one of them calling for back up. I needed to find the stairs and make it the 21st floor, and fast! As I turned and faced them, I must have been a sight for sore eyes because they were shielding their faces and groaning. They looked terrified. What they didn’t realize was that they found my trigger, and I was an explosion waiting to happen. KABOOOM!! They didn’t even see it coming. With lighting speed I threw my scissor-tipped throwing knives and diced up those cards like a Thanksgiving turkey. Now I know why they called them rewards cards. It didn’t make any sense at all until that very moment. Hmm. They were right though—it was very rewarding! There I found myself—looking at the door of the man I despise and wanted to see. The day was finally here! I busted through the door, did a cartwheel, and dove into the corner. Just as I suspected, he was expecting my arrival and prepared to offer me 20,000 free air miles. Stunned for a moment, I paused. “Absolutely not!” I said. “Well if you didn’t want Air Miles then why are you here?”, he said with a puzzled expression. “Yes…but…why are you naked?”, he asked. “I sold everything I owned to pay you off, what was I supposed to wear?” I thought to myself for a second. Perhaps the two men at the door were just trying to cover me up. He stared back at me all teary-eyed and said what they always say. “But don’t you need one card open in case of an emergency, and what about your credit score?” SMACK! BAM! POP! Like a gazelle, I frantically dodged and jumped from side to side to escape what would likely become my financial demise. I made it. Oh how great it feels to be FREE AT LAST! As I left the carnage I knew one thing for sure. I would never ever forget that day as long as I lived! My moment of triumph had arrived at last, and the smile on my face was better than the brightest of days. Life was good! …and that was the day that I killed my credit card!! WOW!!!! Great post! I must say, I paid mine off this year (YES!) yet I’m not brave enough to SMACK! BAM! POP! them just yet… Maybe it’s being a single mom without my ex supporting me that makes me hold on to them. I did cut them all up except for one for “emergencies.” I’m an Enemy of Debt!!! I wonder if I could do this at any moment !!! I don’t pay interests, I just pay my 4 card off every month but it seems I pay them off and have no money left for my living, so I use again my credit cards and continue the wheel rolling. Any idea to stop this wheel ??? AWESOME! I love how you did this. It is a great story. 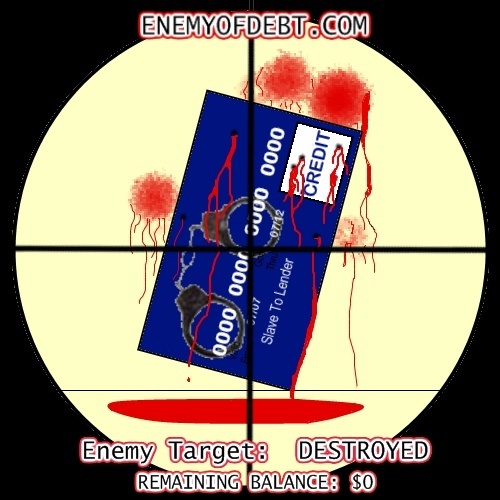 As this points out, it really is possible to set yourself free and become an enemy of debt. The credit card companies have many fooled into believing that one cannot live without their cards. It is simply not true. Pass up the hats and free t-shirts! Reach for something better — a life! I love it! Thanks for sharing your inspirational story. Debt freedom definitely rocks. Hahhahhaha….one of my favorite posts yet from you, sir 🙂 I was DYING at the naked part! haha…..whew, good times good times. haha, I thought you would appreciate it my man! Yeah I tried to throw some humor in there but wasn’t sure if it was over the top cheesy or not. I am glad everyone liked it so far. Tina – Let me just say that your ex should be Smack! Bam! Popped! for not helping you out. 😀 And about closing that last credit card—the day will come! Replace that card with an actual emergency fund and you will be able to say bye-bye for good. ARC – Yessir! Get a good old-fashioned emergency fund, and create a second savings account at your bank for the amount that you currently spend each month with credit cards. Reach for something better is exactly right Jeff! I do not miss credit cards for nothing and my life IS so much better without them. This totally sounds like something that should be made for funnyordie.com, too hilarious! But oh so true how amazing it feels to get rid of all your credit card debt! Nothing creates stress and a knot in your stomach like knowing you owe someone money…. at 20% interest to boot! Great post! You are the bomb!!! I love this story and oh how true it is. Did I tell you I finally did it? I’M DEBT FREEEEEEEEEEEEEEEE! Now all I have to do is save for my house. I’m saving like crazy now. Thanks my teacher, example and friend. You’re an inspiration. Hallelujah! Hallelujah! Hallelujah! And the angels rejoiced in the sky and the heavens opened up and the sun shone down on the Earth. And everything was beautiful and right in the world. AMEN, BROTHER. This is an awesome & inspiring story. Keep fighting the good fight and spreading the good word. I am right behind you! Ashley – Thank you very much Ashley! I’ll have to check that funnyordie.com thing out. Thanks for stopping by and leaving your thoughts. Wow! that’s really great news! Wow !!! It's a great story and i like the line. " why are you naked?”, he asked. “I sold everything I owned to pay you off, what was I supposed to wear?” that's really cool and funny. And ya happy independence day to you. Hoping for a nice and great post from you again. I had a good time while reading your article. It’s hard to get out of debt; and even harder to stay out of debt. But once you’ve experienced living without debt, you’ll never want to go back to dealing with credit card debt again – ever! This can be done by cash-only-living. I’ve been practicing “cash only” for gas and food for over 2 months now and it’s marvelously working for me because I can control my budget. I used to almost always spend beyond my food budget in the past; but nowadays, when I run out of cash, I just stop spending. It’s also much easier now to see where I am in my budget. Living on cash only basis not only teaches me to save money; it also lets me have control on my money. I’d say it puts me in a better financial position than before. This is certainly Amazing! Thanks a ton.